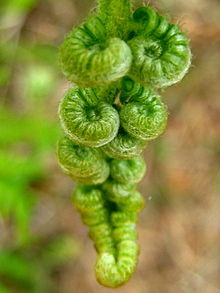 Fiddlehead fern (Matteuccia struthioreris) is a fern in the genus Matteuccia Todaro and family Dryopteridaceae. 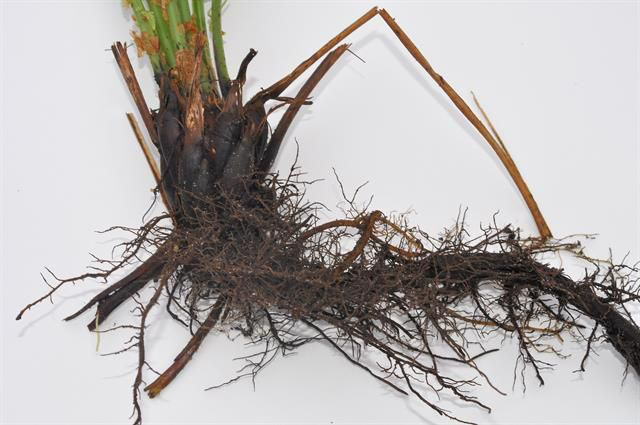 It is a perennial plant which thrives in temperate climate and well drained soils. Fiddlehead fern is also called as Ostrich fern and Shuttlecock fern. The plant of fiddlehead fern grows about five feet long which possess a U shaped grooved on the side of stem. The leaves are pinnate or bipinnate which is bright green in color and usually 4 feet long. The stalk is about 4 cm in diameter and 10-12 cm in height. 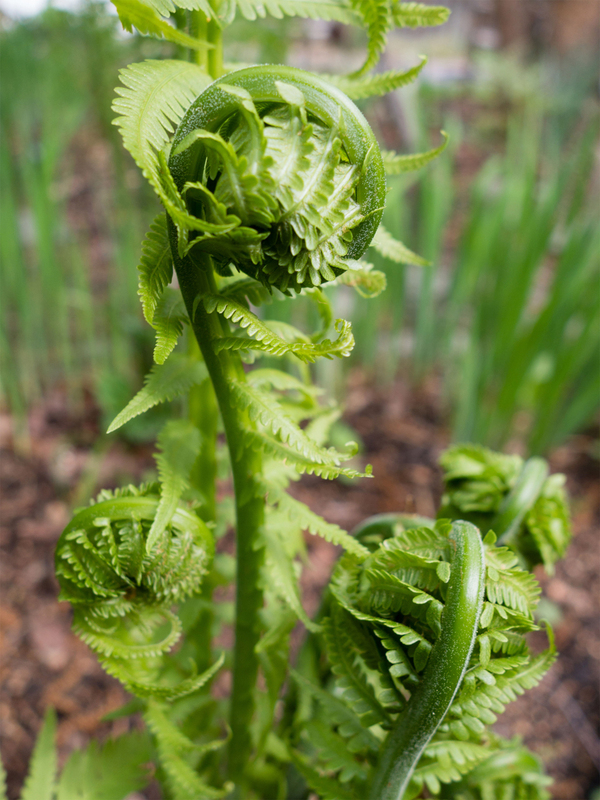 The varieties of Fiddlehead ferns are classified as: Ostrich fern, Cinnamon and interrupted Fern, Lady Fern and Bracken Fern. 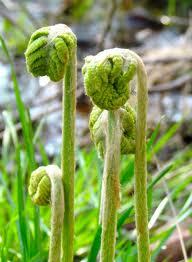 Canada is the nation which has the history of cultivating fiddleheads. 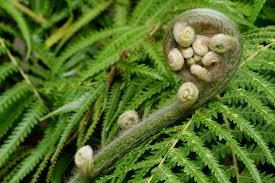 Canadians were connected to this plant that they have fiddlehead themes for lodges and boats. Since the middle ages, fiddlehead ferns were recognized as the regular diet within Australia, Asia, America and New Zealand. 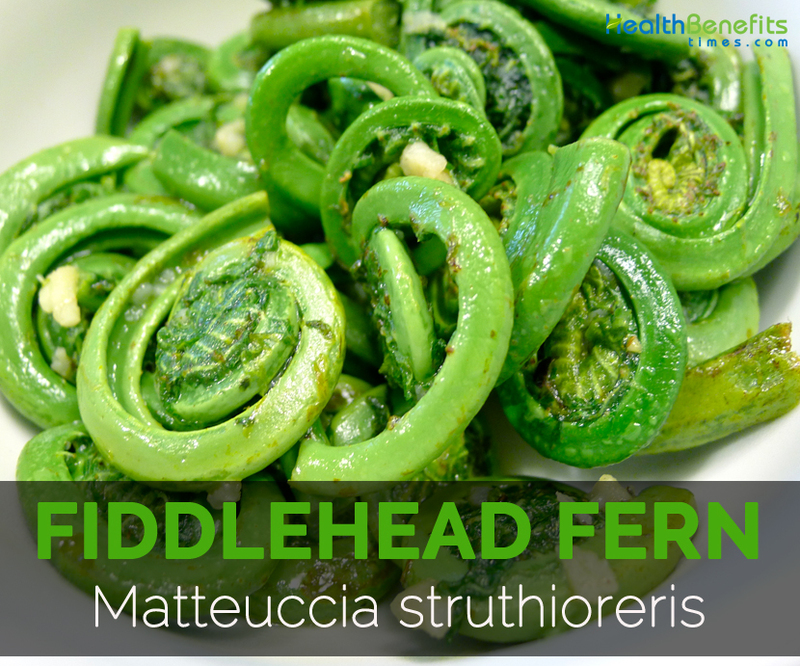 100 grams of Fiddlehead fern contains 34 calories. It possess 4.55 grams of protein, 0.32 mg of copper, 4.98 mg of niacin, 26.6 mg of ascorbic acid, 181 µg of vitamin A, 0.51 grams of manganese and 1.31 mg of iron. It is low in fat and carbohydrates. 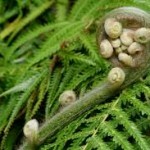 Fiddlehead ferns are used as the part of diet in Asia, Northern France and Native Americans. It is harvested before the frond is opened. 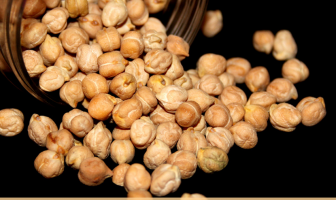 It possesses Vitamin A, a natural anti-oxidant that assists to maintain the mucus membranes and skin integrity. Copper is essential for the oxygenation of red blood cells. The low level of copper results in muscle, joint pain, fatigue as well as poor brain function. The studies also show that deficiency of copper can delay in growth, low weight and height and also slows down the metabolic activities. Niacin helps to treat or maintain the level of cholesterol. It reduces the chances of cardiovascular disease in those patients with mixed dyslipidemia, a condition in which the triglycerides, plasma cholesterol increases. Niacin is also beneficial for the people who have high chances of stroke, heart attack or other diseases. The studies show that niacin helps to enhance the good cholesterol level and reduces triglycerides and bad cholesterol. The high amount of Vitamin C promotes the drugs which are used in chemotherapy. Vitamin C helps to target the cell which requires the nutriments without harming the normal cells. The research shows that Vitamin C is effective cancer treatment for the lung and ovarian cancer. The research shows that Vitamin C is helpful for those having weak immune system caused due to stress. As stress is the common condition which is experienced in the society, the adequate amount of Vitamin C helps to improve the overall health. Vitamin A eliminates free radicals which damage the cells as well as tissue. It prevents the cells being overactive that leads to inflammation and food allergies. The intake of Vitamin A helps to reduce the chances of food allergies. It also decreases the inflammation which also reduces the chances of neurodegenerative diseases such as Parkinson’s and Alzheimer’s disease. Vitamin A helps to prevent macular degeneration which may result in blindness. The intake of vitamin C, A, E, copper and zinc helps to reduce the chances of macular degeneration by about 25 percent. The studies show that Vitamin A eye drops helps to treat dry eyes. It also slows down the development of Stargardt’s disease which causes vision loss in the youngsters. Manganese with zinc, copper, calcium helps to lower the chances of bone loss in the older women who are more prone to weak bones and bone fractures. The deficiency of manganese increases the chances of bone related ailments. Manganese helps to form the bone regulatory enzymes and hormones which are involved in the process of bone metabolism. The studies shows that the intake of manganese with vitamin D, calcium, copper, zinc and boron can promote the bone mass in women having weak bones which help to treat osteoporosis naturally. The low level of hemoglobin and red blood cells are the cause for anemia because low amount of oxygen is transport to the cells. Anemia results in low level of energy, poor immunity and slow brain function. Most of the people are suffering from anemia due to the deficiency in iron. It is proven that Vitamin B2 is effective to treat the migraine headaches. Physicians recommend 400 mg dose of riboflavin which helps to treat and cure the headaches and migraine attacks. Riboflavin lowers the frequency of migraines, reduces its symptoms as well a pain experienced during migraine. Phosphorus acts as phospholipids which is a component of biological membranes such as nucleic acids and nucleotides. It helps to balance the pH level in the body restricting the excessive alkali or acid compounds. This assists the digestion process by granting the healthy bacteria to remain in the gut. Phosphorus reduces the water retention, diarrhea, bloating which promotes the digestion. In Indonesia, the young fiddleheads are prepared in rich coconut sauce which is spiced with galangal, chili pepper, turmeric leaves, lemongrass and other spices. In Philippines, fiddlehead is used to make a salad along with salted egg slices, tomato and vinaigrette dressing. In Garhwal (Uttarakhand), it is consumed as a vegetable. It is pickled in the form of achaar. It is cooked as side vegetable dish usually dried to eat with parathas or rotis. Fiddlehead can be consumed boiled, steamed in soups, stir-fried, sautéed, fried and baked. Fiddleheads should not be consumed raw because it may make the stomach upset and has bitterness until it is cooked. It may cause food poisoning if it is not prepared, cooked or stored properly. 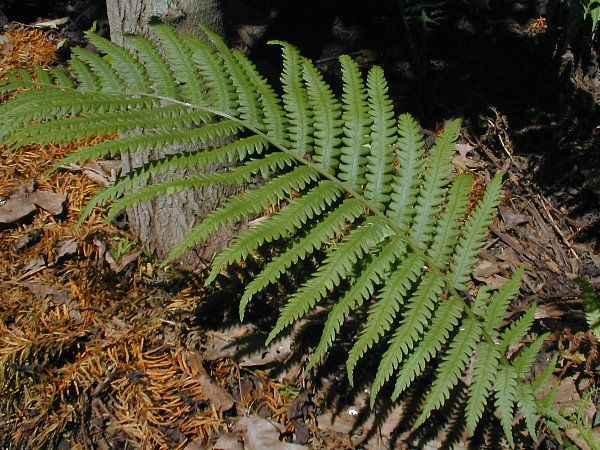 The excessive consumption of male fern extract or powder can cause coma, muscular weakness, and problems in eyes. 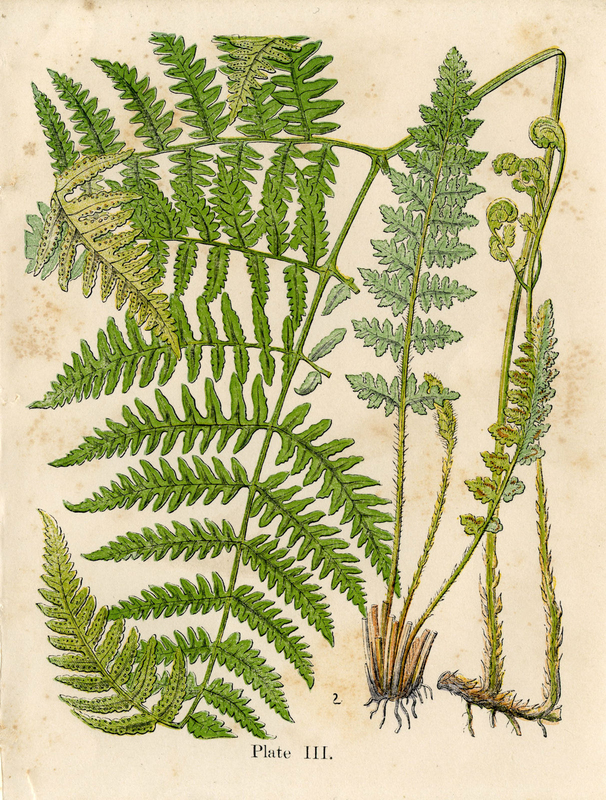 The fiddlehead fern determines the ostrich fern. Ostrich fern is found in Newfoundland, Alaska, British Colombia, South and Northern California, Southern Appalachians and Midwest. It grows about 3-6 feet high. Five to nine fronds are organized in the rosette form. Ostrich ferns has spores on brown fronds which are small in comparison to others. 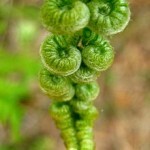 Cinnamon fern is usual on sandy soil. 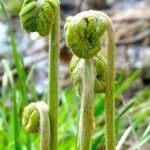 It is a considered as delicious fiddleheads but is slightly harmful. Lady fern is found in damp conifer and deciduous woodlands. The rosettes possess 3-7 fronds which rise about 2-3 feet high. The groove is running down on the top of stalk. 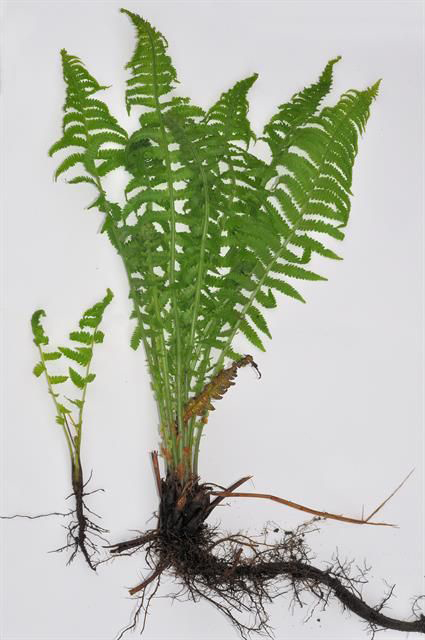 Bracken fern is typical and huge fern which has solitary and vertical stem. 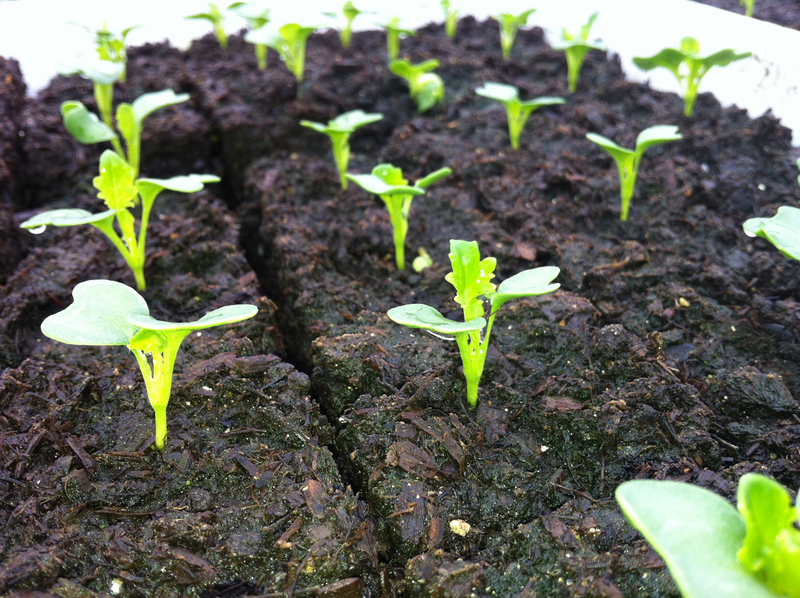 It is considered as the conventional food in North America. It possess the powerful carcinogen which is called ptaquiloside which could be destroyed by cooking. 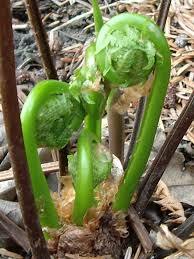 Besides cooking, fiddleheads are used as the decorative element in home gardens. Fiddleheads are unique due to their interesting shapes and patterns. Due to its decorative value, it sold in high costly rate in temperate regions. Fiddlehead bouquets are quite popular like indication of modern expression. The fiddlehead designs and patterns in mittens, show pieces are increasingly poular. Fiddleheads are used like veggies across the world. 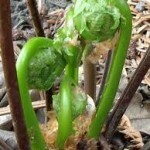 They should be harvested in initial phase before the fronds unfurl. Coiled crosiers has fragile taste. Calories 34 Kcal. Calories from Fat 3.6 Kcal. Calories 34 Kcal. Calories from Fat 3.15 Kcal.